JNN 02 Oct 2015 Jeddah : A senior Saudi prince has launched an unprecedented call for change in the country’s leadership, as it faces its biggest challenge in years in the form of Self created War, Plummeting oil prices and Harsh criticism of its management of Haj Services , after the two deadly events at Mecca, scene of last week’s hajj tragedy. The prince, one of the grandsons of the state’s founder, Abdulaziz Ibn Saud, has told the Guardian that there is disquiet among the royal family – and among the wider public – at the leadership of King Salman, who acceded the throne in January. The prince, who is not named for security reasons, wrote two letters earlier this month calling for the king to be removed. A clutch of factors are buffeting King Salman, his crown prince, Mohammed bin Nayef, and the deputy crown prince, Mohammed bin Salman. A double tragedy in Mecca – the collapse of a crane that killed more than 100, followed by a stampede last week that killed around 1350 – has raised questions not just about social issues, but also about royal stewardship of the holiest site in Islam. As usual, the Saudi authorities have consistently shrugged off any suggestion that a senior member of the government may be responsible for anything that has gone wrong. Local people, however, have made clear on social media and elsewhere that they no longer believe such claims. “The people inside [the kingdom] know what’s going on but they can’t say. The problem is the corruption in using the resources of the country for building things in the right form,” said an activist who lives in Mecca but did not want to be named for fear of repercussions. “Unfortunately the government points the finger against the lower levels, saying for example: ‘Where are the ambulances? Where are the healthcare workers?’ They try to escape the real reason of such disaster,” he added. According to Alastair Newton, director of Alavan Business Advisory, Saudi Arabia’s published budget this year was based on oil trading at about $90 a barrel. But because of costly ad hoc items such as royal largesse after King Salman’s succession, the war in Yemen, and domestic security against the ISIS threat, the fiscal position is only in balance at about $110. With oil now trading below $50, fiscal weakness is starting to tell. The Saudi benchmark Tadawul All Share index has fallen by more than 30% in the past 12 months. “They have enough reserves to sustain this situation for at least one year although it is very costly for them,” said Khairallah Khairallah, a former managing editor of the Saudi-owned al-Hayat newspaper. The International Monetary Fund is already predicting Saudi Arabia’s budget deficit to exceed $107bn this year. Yet the budget announced for next year has marginally increased. “The king is in charge of oil policy in the kingdom together with his son Mohammed bin Salman. Mohammed bin Salman is also responsible for [state oil firm] Aramco. The crown prince [Mohammed bin Nayef] is mainly focused on security. These are the main players in Saudi Arabia. They divide the responsibility,” said Khairallah Khairallah. Prince Mohammed bin Salman is a new arrival to the Saudi senior leadership team but has already become one of the most controversial. Although still very young by Saudi standards – officially 35 but rumoured to be much younger – he holds a multitude of posts including minister of defence and chair of the Council for Economic and Development Affairs, which is the country’s main economic policymaking committee. This makes him responsible for many of Saudi Arabia’s problems, above all the war in neighbouring Yemen, where Innocent civilians have come under attack , in Place of rebel Houthis from Saudi aircraft and ground forces. Many Saudis are sickened by the sight of the Arab world’s richest country pummelling its poorest, and as the cost in lives and treasure grows, criticism is mounting that Prince Mohammed bin Salman– whose unofficial nickname is “Reckless” – rushed in without a proper military strategy or an exit plan. “This is a war against the Yemeni nation and against Yemen becoming independent,” said Sgt Maj Dakheel bin Naser Al Qahtani, a former head of air force operations at King Abdulaziz airbase, Dhahran, who defected from the Saudi armed forces last year. “It has no legitimate political foundation and it is not what the people want,” he said. “Ninety per cent of people in Saudi Arabia don’t want this to happen, exactly the opposite of what the media shows. The letters in Arabic calling for the overthrow of the king have been read more than 2 Million times. 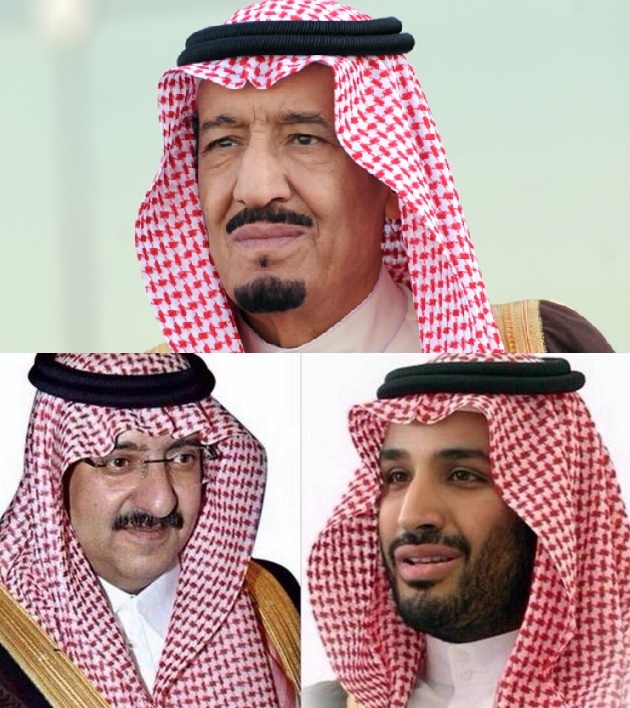 The letters call on the 13 surviving sons of Ibn Saud – specifically the princes Talal, Turki and Ahmed bin Abdulaziz – to unite and remove the leadership in a palace coup, before choosing a new government from within the royal family. “Allow the oldest and most capable to take over the affairs of the state, let the new king and crown prince take allegiance from all, and cancel the strange, new rank of second deputy premier,” states the first letter. The letters are unlike anything that has happened since King Faisal deposed King Saud in a palace coup in 1964. The prince behind the letters claims to have received widespread support from both within the royal family and society at large. But only one other senior royal has so far publicly endorsed the letter, which may be unsurprising given the Saudis’ brutal history of punishing political opponents. Like many modern Arab countries Saudi Arabia is a 20th-century construction. Since 1932, when Saudi Arabia was founded, the royal family has kept the country together masterfully. But as the economic and political situation in and around Saudi Arabia deteriorates, and royal family infighting intensifies, the possibility of a profound change is growing more likely in the Nearest future. This entry was posted in Middle East and tagged Coup, King Salman bin Abdulaziz, Prince Muhammad Bin Nayyef, Prince Muhammad bin Salman, saudi monarchy. Bookmark the permalink.